Grilling, like most forms of cooking, is more art than science. There are a few basic rules, but after that, it is your skill and style that will make you a great (or not so great) griller. 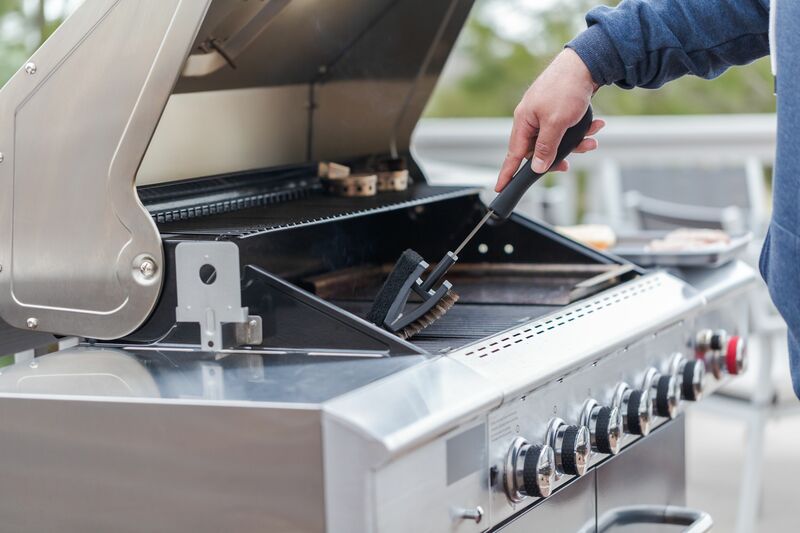 A few simple tips will help you avoid common gas grill problems. Maintaining a clean grill will reduce the chances of flare-ups and incessant smoke, which will burn the outside of food and impart a bad flavor. Many people simply turn the grill on high for 10 to 15 minutes to let the heat burn off the grease or then scrape off any residue from the grill grates. A lot of the grease does get burnt off during a high-temperature "clean," but not all of it. Using a grill brush will help remove stuck-on food, but it also pushes the debris into the grill itself. Food that falls into the grill, ash deposits, and other gunk remain inside the grill until a cleaning. 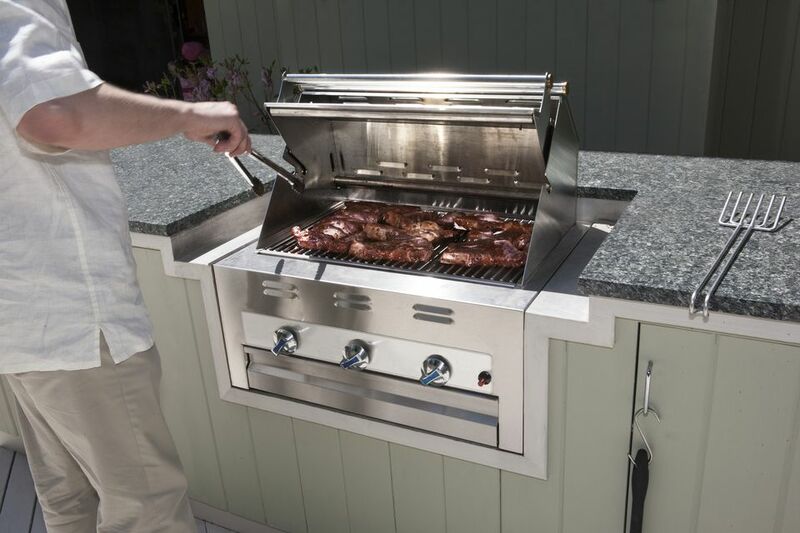 Remove the grates and burner covers at least twice a year to thoroughly clean the grill. (If you grill frequently, do this more often.) After a deep cleaning, you will likely notice a difference in how your grill performs. There are two important rules to keep in mind when it comes to fire: fight a fire when you want to put it out and control the fire when you want to use it. Flare-ups are a result of a cooking fire and should be controlled, not fought. Always try to keep a portion of your grill empty so you can move the food should a flare-up occur. When you do have a flare-up, move the food away from it and let the flare-up burn off with the grill lid up. If the fire spreads, remove all food from the grill and let the fire burn off the grease as quickly as possible. If your fire gets out of control, remove the food from the grill and turn off the burners and the gas. Leave the lid open and let the fire die down on its own. Barbecue chicken dripping with sauce or ribs coated with a flavorful rub are often a cookout favorite. Sugar burns easily, so there is a risk of burning or blackening foods with sauces or rubs that contain sugar. Keep your grilling temperature below 265 F (130 C) to prevent charring. This is similar to the "low and slow" style of barbecue, which may take a lot longer to cook but will almost guarantee a successful outcome. So many stories about burning food on the grill start with, "I just stepped inside for . 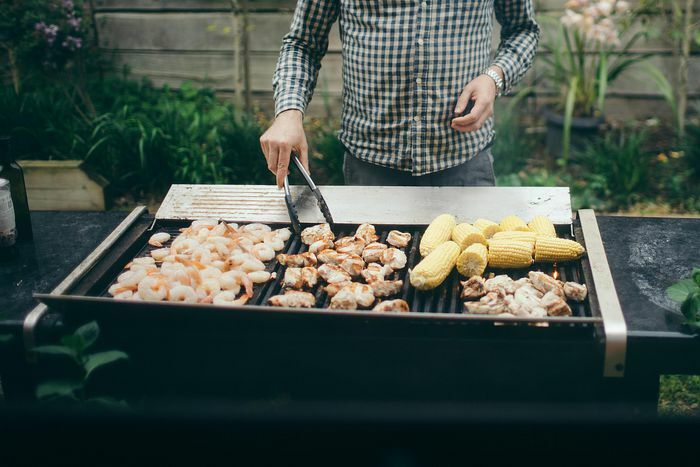 . ." Whether checking the score of the game, mixing up a side dish, or just hanging out with family or friends, a short moment away from the grill is enough time for it to get out of control and burn your food. Successful grilling means paying attention to the grill. This is particularly true for burgers, chops, and steaks, which are usually cooked at a hot temperature very quickly. Have all your preparations done before the food hits the grill and keep an eye on what you're grilling. Have you ever run out of gas while grilling? Even worse, was it with a group of hungry guests waiting for dinner? It's a big pain to leave the house to refill a propane tank mid-cooking. Keep extra fuel on hand and you will never have to worry about running out of gas. Successful grilling means safe grilling; practice food safety with everything you cook. Use different plates for bringing raw meat to the grill and serving the cooked meat. Cook proteins to a safe temperature and consider using a meat thermometer to test temperatures. Keep your cooking area clean and sanitized to avoid any cross-contamination. Even though your grill goes to high, it doesn't mean everything has to be cooked at that temperature. Thin cuts of lamb, pork, or beef (including burgers) should be cooked hot and fast. More delicate items like fish, vegetables, and chicken are best cooked at medium. Roasts, whole chickens, and thick, large cuts of meat need to be cooked at lower temperatures, indirectly (meaning next to the heat, not above it). Follow these guidelines for whichever food you cook and be patient with the cooking times, which will be longer at lower temperatures. Searing is one of the secrets to great, grilled flavor. While it doesn't lock in juices, it does caramelize the edges of meats, making a flavorful, crisp surface. This process works with almost any cut of beef, lamb, or pork. To sear, start with a grill as hot as it will go. Put the meat on and wait 1 minute. Flip the food and reduce the heat. The high temperature will caramelize the meat's surface. Once this is done, lower the heat, or move the meat to a cooler spot on the grill and continue cooking until done. Indirect grilling is the secret to versatility with your grill. While direct heat is great for cooking hot and fast, indirect grilling lets you grill whole chickens and large roasts, and even bake bread. Simply turn off the burners that sit directly under what you are cooking and keep the surrounding burners on. With a large multi-burner grill, this might mean that the left and right burners are on while the middle burners are off. Another option is to keep one side is on while the other is off. Meats can be seared first by direct heat, and then moved to indirect heat to slowly roast. You can cook moist, tender meats at lower temperatures without burning the outsides. Performing regular maintenance on your grill will keep it working better and longer. Start with a good grill cleaning and continue to a full inspection of all the internal parts. Check the burners to make sure that the ports (holes where the flames come out) are not clogged. If they are, use a thin wire or pipe cleaner to clear any obstruction. Blocked ports cause uneven flame and can cause burners to fail. Check the igniters to make sure there ​is a good spark and the grill lights properly.